Accra, Dec. 15, GNA - Nana Addo-Dankwa Akufo-Addo, Minister of Foreign Affairs, on Wednesday outlined the new policy agenda of the Government for the second term of President John Agyekum Kufuor. The agenda includes intensification of the fight against poverty with humane centred economic policies to improve significantly the prospects for jobs and improving the living standards of the people thereby leading them out of mass poverty into relative prosperity. It would pursue vigorous support for the growth of the Private Sector to lead the economic transformation of the country for the attainment of middle-income status within the next decade. Nana Akufo-Addo, who was interacting with Diplomatic Corps on the outcome of the December 7 Presidential and Parliamentary Elections, said the New Patriotic Party (NPP) Government intended to leave a legacy of Golden Age of Business at the end of its second term. On foreign policy direction, the Minister of Foreign Affairs said the country would continue to play an active and constructive role in the world community, especially in fostering peace, stability and democratic development in West Africa and Africa. He, therefore, called for continued solidarity and support from the international community towards the attainment of the objectives of good governance in the West Africa Sub-Region. Nana Akufo-Addo commended the international community for their support before, during and after the General Election. He expressed the sincere appreciation of the Government and people of Ghana for the considerable technical, financial and other support, which their respective governments gave towards the elections. Speaking on the elections, Nana Akufo-Addo said the level of political awareness and maturity exhibited, demonstrated the commitment of Ghanaians to the preservation of democratic principles and adherence to the values of democratic accountability, respect for human rights and rule of law. He also expressed Government's concern about the isolated incidents of violence in some parts of the country stressing: "Government is deeply concerned about these reports and has ordered immediate action by the law enforcement agencies and national security apparatus to take steps to arrest the situation. "Investigations are also being conducted into the specific incidents with a view to bringing the lawbreakers to justice." 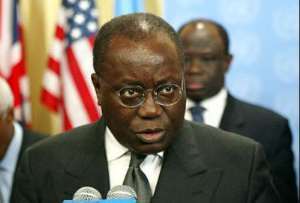 Nana Akufo-Addo told the Diplomatic Community that the government was firmly in control of the situation.